Lauren Greenfield examines materialism, celebrity culture, and social status and reflects on the desire to be wealthy at any cost. 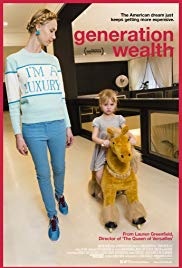 This visual history of the growing obsession with wealth uses first-person interviews in Los Angeles, Moscow, Dubai, China and around the world to bear witness to the global boom-and-bust economy, and to document its complicated consequences. I haven’t finished it, but my biggest takeaway is that you shouldn’t be obsessed with certain things because even if you get what you think you want, you still won’t be happy or content! If all you care about is money, you’ll never have enough money. The millionaire wants more. The billionaire also wants more. Someone else will always have a nicer house and a bigger yacht. If all you care about is your looks, you’ll never be pretty enough. Your body can never be too skinny, your lips can never be too full. If someone gave you a $1 million of plastic surgery, you would probably end up just as unhappy as today. If all you care about is social status, you will be striving forever. Why spend your life trying to impress people who don’t matter? The celebrities you want to be like? They aren’t all that happy either. Obviously I think money is important, otherwise I wouldn’t be here. But money is a tool, not the goal. Can you use your energy in a useful and meaningful manner? Can you cover the basics – safe housing, clean food, and quality healthcare? Do you have loved ones with whom to share your time? None of the answers to these questions require a brand name. None require looking up to anyone on Facebook or Instagram. I try to remind myself of this regularly, whenever I feel the urge to “upgrade” something. Watching this film made me feel exhausted more than anything else. These people are wasting so much of their life energy chasing something they’ll never reach.